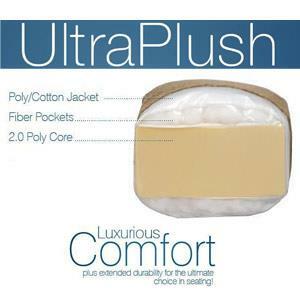 UltraPlush seat cushions with Poly/Cotton Jacket surrounding Fiber Pockets and 2.0 High Density cushion cores provide superior comfort and support, as well as extended durability. Details such as the nail head trim along the arms of this four-piece sectional help to create its inviting casual style. The chaise provides a space perfect for curling up to read a good book or for taking a quick catnap. With an abundance of seating options this sectional is a perfect addition to the living room of an avid entertainer. Its comfortable, plush cushions and large toss pillows ensure that you and your guests can sit back, chat, and relax for hours on end. The Dellara Casual 4-Piece Sectional with Left Chaise by Benchcraft at Walker's Furniture in the Spokane, Kennewick, Tri-Cities, Wenatchee, Coeur D’Alene, Yakima, Walla Walla, Umatilla, Moses Lake area. Product availability may vary. Contact us for the most current availability on this product. 3210116 Left Arm Facing Corner Chaise 1 36" 58" 38"
3210177 Wedge 1 39" 39" 38"
3210156 Right Arm Facing Loveseat 1 58" 39" 38"
3210134 Armless Loveseat 1 52" 39" 38"
Create a welcoming space with touches of sophistication with this living room collection. With details such as their plush cushions and nailhead trim, these pieces are able to rock both elegant dinner parties and family movie night. The Dellara collection is a great option if you are looking for Casual furniture in the Spokane, Kennewick, Tri-Cities, Wenatchee, Coeur D’Alene, Yakima, Walla Walla, Umatilla, Moses Lake area. Browse other items in the Dellara collection from Walker's Furniture in the Spokane, Kennewick, Tri-Cities, Wenatchee, Coeur D’Alene, Yakima, Walla Walla, Umatilla, Moses Lake area.